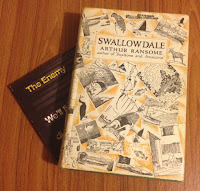 A few months ago I devoured the first book by a new-to-me author in a matter of days. It was an epic story of life, death, love, learning, music, friendship and more and when I finished the last sentence I was broken. Not by the book, but by the absence of its sequel, which I desperately wanted to pick up and start reading but hadn't yet bought. The first book had consumed me, grabbing my attention in the way only a book can, so that at every possible moment I dropped what I was doing and returned to its pages. 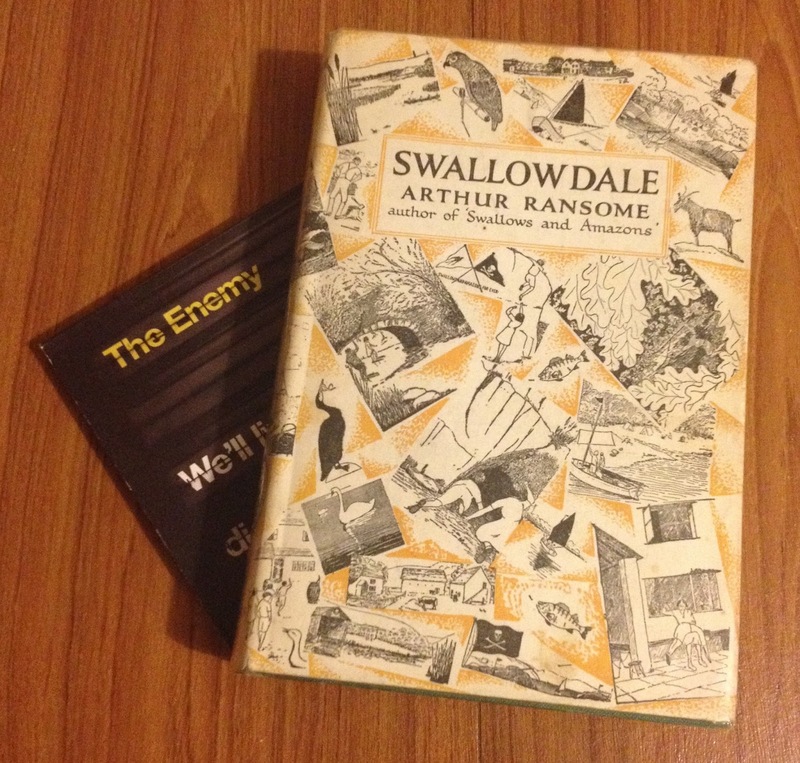 Then it was over and I was left with the impossible task of finding something else to read that would be even half as engrossing. Admit it, most of you know what I'm talking about? 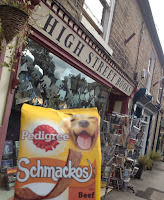 So what relevance does any of that have to this week's bookshop? Despite it being unusual to find science fiction and fantasy in many indies, this week's destination is known specifically for that genre. 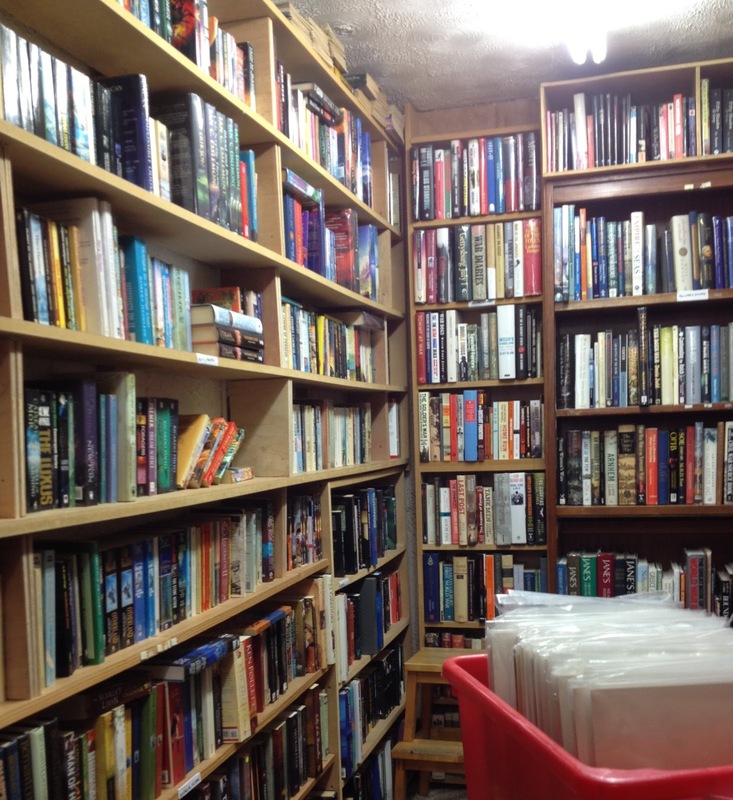 Given my reading state of mind, Red Lion Books in Colchester was somewhere I had to visit, and fast – I made it part of my Independent Bookshops Week 2015 bookshop crawl. Found in a town centre location, the bookshop is large enough to rival a chain and was being enjoyed by a good number of customers during my visit. The front part of the shop houses mainly non-fiction, moving on to fiction and then books for younger readers, all of which would be more than enough to challenge the willpower of your average bookworm, but I was on a mission. I took a walk downstairs. 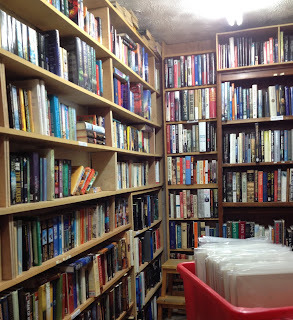 Almost the same size as the ground floor, I found myself in a room large enough to house events, more non-fiction and a good offering of local interest books, and the genre I was looking for. Taking up the space occupied by your average boutique indie, the science fiction and fantasy section is easily one of the largest I've seen on my bookshop travels. It was heaven. Moving from recommends, to sci-fi, to fantasy, to retro sci-fi (my guilty pleasure) and on to yet more recommends, I was spoilt for choice. Then there was the moment of (temporary) disappointment as I got to S in fantasy and there wasn't a single book by the author I was looking for, followed by sheer joy as I reached the next bookcase and realised Brandon Sanderson had been picked out and given a shelf of his own under popular authors. In case you're wondering, he's been recommended as someone who'll "get me through my Rothfuss cravings". Choosing The Final Empire, Part One of Sanderson's Mistborn series, I found myself really struggling not to buy up the rest of the bookshelf, knowing it will be a while before I'm again treated to such a realisation of my bookish fantasies. 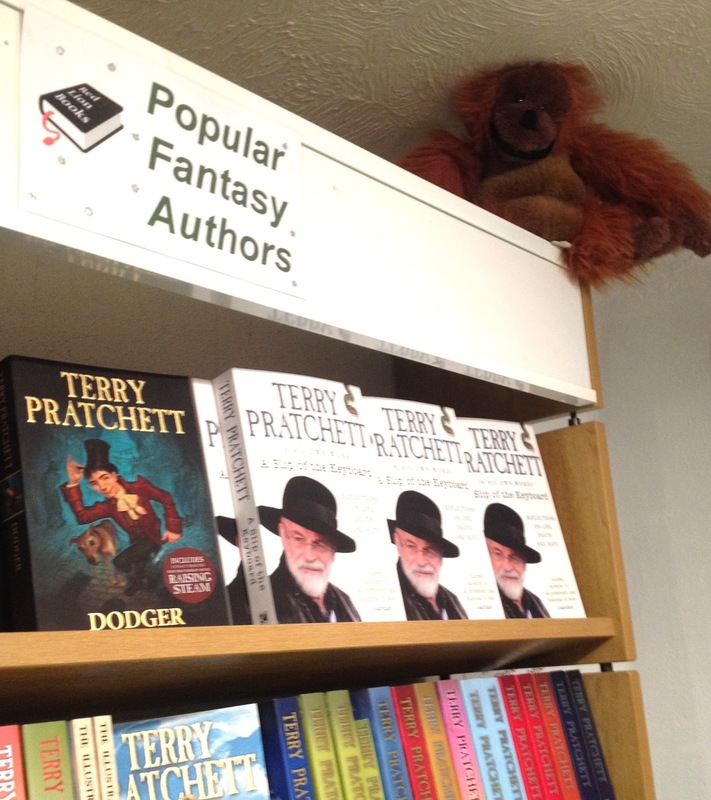 Instead I stuck to my one book per shop rule and slowly moved away from the bookcase, which, incidentally, was topped by two rows of Terry Pratchett's works, overseen by an orangutan librarian. I'm not a fan but who wouldn't appreciate such a detail? Back upstairs, I enjoyed the mystery proof lucky dip in honour of IBW2015, picking what later turned out to be Willow Trees Don't Weep by Fadia Faqir, before continuing on my road trip. 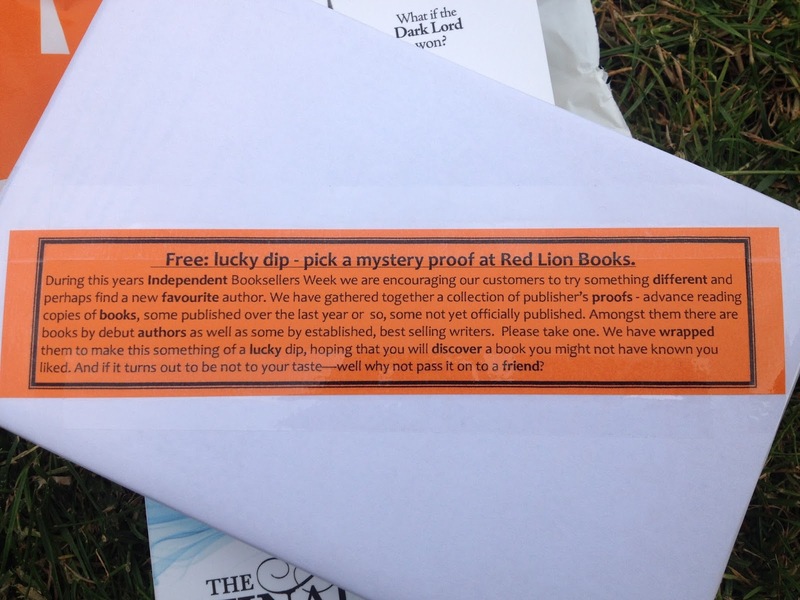 To finish, yes it'd be great if independent bookshops were able to stock more of the genre. But maybe that's what's so special about fantasy: it's not part of the every day. 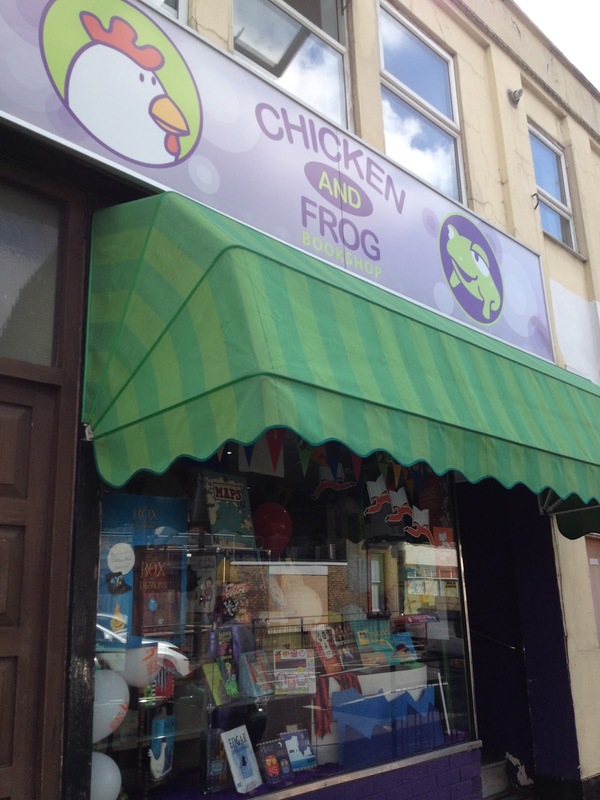 Crossing a busy, slightly grey, street, it's impossible to imagine what's hidden behind the small shop front of Chicken and Frog Books. 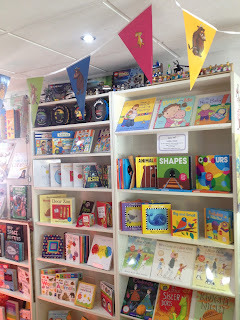 Sure the shop front looks friendly enough – but as I said last week in my overall write up for Independent Bookshops Week – opening the door takes you to wonderland. 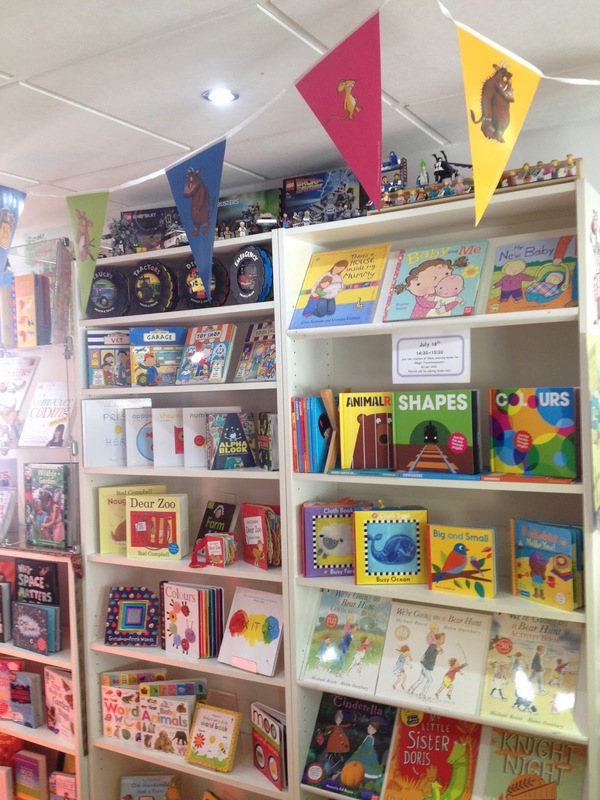 Starting with a hello, it took a matter of seconds for me to feel at home in this children's bookshop as Natasha (aka Mrs Chicken) welcomed me in and struck up a conversation. Blue-haired and wearing a cheerful red dress, she was every bit as brilliant as her surroundings, which were a mass of colour and books and stuff, all of it dedicated to catching the attention of little (and slightly less little) people. From the Lego minifig collections on the top of one set of bookcases to chickens along the till, with Ghostbusters, pictures, random displays and a delightful collection of gifts from children – all of the latter being proudly introduced during the course of our later conversation – this bookshop is simply alive with colour. Not forgetting the books, which practically cry out to be read by young visitors as they curl up on the sofa at the back. As a not so young visitor I was still in heaven, enjoying every detail and thinking how great it would be to curl up on said sofa with a book or two and enjoy my surroundings. And I did get to enjoy that sofa for a little while, as Natasha picked out recommendations and invited me to sit and take my time selecting the book was for me. Her enthusiasm meant it wasn't easy choosing just one from the brilliant selection picked out for me, so the invitation to sit and read was a winner. Selecting The Girl Who Circumnavigated Fairyland in a Ship of Her Own Making by Catherynne M Valente, it was time to introduce myself properly and ask more about the shop. At just a couple of years, Chicken and Frog has grown up with its customers, something that made me even more impressed as we talked about all the goings on. 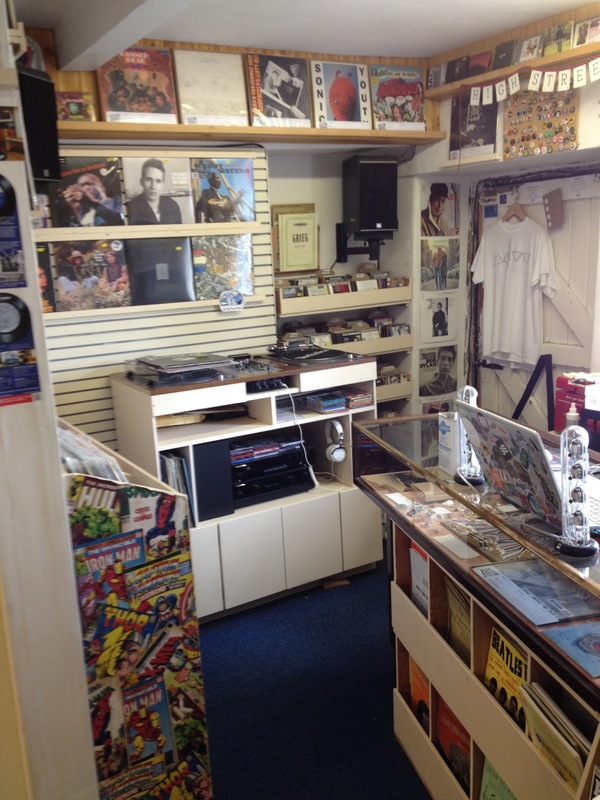 This includes a 'classroom' tucked away at the back of the shop for book events and children's parties, and a whole raft of other activities for youngsters. I wish I'd been lucky enough to grow up alongside a bookshop.